Designed in 1930, this notable Deco structure was originally a library. The Bass Museum will be increasing its exhibition space by late 1999, with an $8 million project designed by acclaimed architect Arata Isozaki in conjunction with Spillis Candela Partners, Miami. It will include an outdoor sculpture terrace, cafe, courtyard and a larger museum shop, which will enable the Bass to feature more extensive exhibitions. considered by many architectural historians to be the most significant of the Art Deco structures in Miami Beach's internationally renowned historic district. Beginning its life as the Collins Library, the building became the Bass Museum of Art on the occasion of April 7, 1964 with a breath of life conferred by its founding donors, Johanna and John Bass. The Bass' were a prodigiously successful, talented couple who contributed to the cultural life and affairs of Miami Beach with the opening of the museum, and their endowment of over five hundred works of art. The permanent collection of the Bass includes 15th to 20th century European art, baroque painting and sculpture, textiles, modern American art, architecture and design. Speaking about the uniquity of the Bass, Diane Camber, the museum's Executive Director commented, in a recent interview: "I think it really has a special niche, and it's very unique in the type of core collection it has, and sub-collections have been added to it. To begin with, the original Bass collection, the old master collection, which is predominantly European, is the only one of that kind that you can see in this part of the world. Most of the other museums are focused on contemporary art, post-war art and particularly American art. But we also have in our collection examples of contemporary art, and very fine ones." Recent acquisitions by the museum include a massive archive of drawings and vintage photographs specifically pertaining to architectural design and Art Deco, and this resource has been made available to those working on renovation projects of such structures. The Bass has hosted some extraordinary, poignant, and enjoyable exhibitions in the past, which have included: "The Precious Legacy: Judaic Treasures from the Czechoslovakian State Collections," culled from the WWII era Nazi exhibit, "Museum of an Extinct Race;" "The Palaces of St. Petersburg;" "Meret Oppenheim: Beyond The Teacup;" "Origins of Modern Design in Art Nouveau and Art Deco," which was the first public showing of works from Micky Wolfson's personal collection, and might possibly have been the genesis of his compulsion to open a museum in Miami Beach, etc. The 1997-98 schedule line-up appears to be no less intriguing. "Putt-Modernism," a very recent show, found both the Bass and the Lincoln Road's South Florida Artcenter "transformed into a miniature golf course designed by twenty-one significant artists and architects," featuring subjects ranging from Elvis to political commentaries on AIDS as well as Senator Jesse Helms. "Claudio Bravo: Wrapped Packages," featuring twenty "very realistic paintings of and drawings of wrapped packages," will be on exhibit from November 13, 1997 through January 11, 1998. Also on the schedule for the coming season are "Picasso: The Vollard Suite," and "Mestre Didi." There is more to the museum's scope, however. The museum has a mission to involve itself internationally. The name of the Bass is carried forth not only by exhibitions it has organized, but also by loans from its extraordinary and unique collection, and much more. Additionally, The Bass collection will soon be available across the planet electronically. 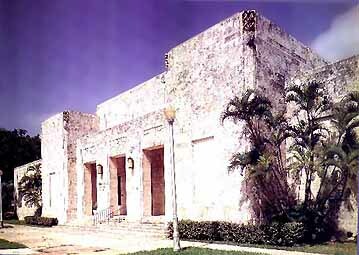 The Bass Museum is located one block west of Collins on Park Avenue between 21st and 22nd streets in Miami Beach.